This article discusses how to use schedules with children to promote positive behaviors. Strategies can also be utilized with adults with special needs. Using visual schedules for individuals who may have trouble with reading or language is discussed as well. Schedules can make a positive difference in a child’s behavior in class or at home. When a schedule is in place, children know what is coming next and what is expected of them. Knowing what is coming next lessens anxiety because there is no uncertainty about what they are going to be doing. As adults, we set up our day and we make our own choices, so we know what is coming next. Imagine doing one thing and having no idea what is going to happen when you are done, or picture someone coming over to you before you are finished with something you enjoy, stopping you from what you are doing, and demanding that you do something else. These situations would stress or frustrate most people. This is often what happens to children when schedules are not in place. 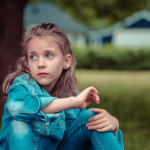 Young children or children with autism, anxiety, or ADHD could get anxious or frustrated, when they are directed to do something they were not expecting, or when they are abruptly told to stop a preferred activity. This could lead to challenging behaviors. They also may have troubling remembering or visualizing, if you simply tell them how the day will unfold. A schedule makes it easier to understand, follow, and remember the expectations of the day. Also, when a schedule is in place, children get used to their routine. Although schedules should be slightly varied from day to day to allow for flexibility, they should be similar enough to allow the child to become comfortable and familiar with his routine. When a child is comfortable in his routine, he also feel less anxious and needs less reminders from you about what is expected. If you consistently implement this schedule, your child can start to implement some of these tasks without you even asking. It will be so nice to have your child complete his homework, set the table, and tidy up his room without constant reminders from you. Also, if he is expected to follow the schedule, you are setting up a realistic way to make your child accountable for his own behaviors. Children often have a lot of expectations to meet. They have trouble being accountable because they have difficulty managing their tasks in an organized way. A schedule allows them to do this. Keep in mind that some children will become overwhelmed with a schedule containing this many steps. In that case, limit the schedule to the few most important things you want the child to accomplish, or cover up steps, only revealing a few steps at a time. Children who are not used to the approach of enforcing a daily schedule may complain or argue initially, but when they see you are going to implement it consistently and not budge on your position, they will learn to follow the rules. Some children even find it fun to follow and complete the steps in a schedule. Allow the child to participate in the creation of a home schedule. 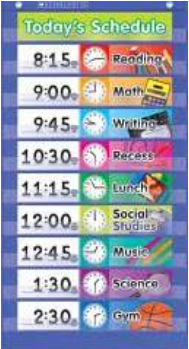 At school, schedules are often created by the teacher, but allow the children in your class to participate if possible. Once the schedule is created, review it thoroughly with the child to the best of their ability to ensure understanding. 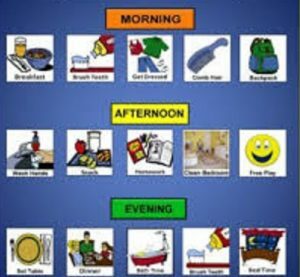 For children with speech and language delays or difficulties, such as those on the autism spectrum, visual schedules with pictures of each activity may work best (resources for creating picture schedules are found at the bottom of this article). Children with difficulty understanding language may understand their schedule better if you show them exactly how to use it and practice it several times. 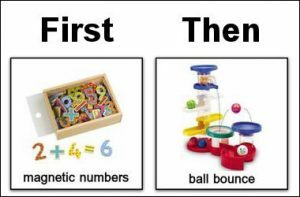 You may need to point to the pictures and actually carry out the tasks with the child, before they are able to use it with more independence. Some children may always need reminders to use the schedule, such as pointing to the schedule or walking them over to check the schedule. To reinforce the schedule, acknowledge the child’s efforts when they follow it (e.g., great job with your schedule tonight, nice work following your schedule, you were so responsible completing your schedule today, etc.). Children with language difficulties may benefit from a gesture or physical praise (e.g., thumbs up, smile, pat on the back, hug, high five), rather than verbal acknowledgment. It all depends on the child though. Some children respond best to verbal praise, others to gestures or physical praise, while some children may seem to not respond to praise at all or may not like certain kinds of praise. For children who seem to show no emotion when you praise them, continue to do so anyway because their response on the outside may not match the feeling they get from praise on the inside. Experiment to see what works or doesn’t work for your child or student. For any child following a schedule, you can tie privileges to the completion of the schedule. 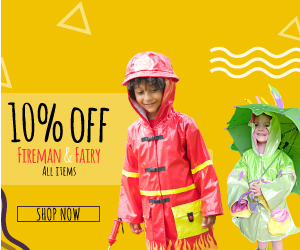 For example, you can tell the child that he can pick a special activity of his choice once he has completed the schedule or after completing the schedule accurately for a certain number of days. For children with language difficulties or intellectual disabilities, who may not understand that they are working towards earning a privilege, still allow them to earn a privilege (something you know he or she enjoys) after reaching a predetermined goal. 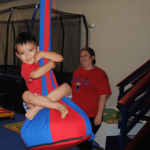 For example, if your child loves to watch TV or jump on a trampoline, allow him to earn one of these preferred activities for appropriately utilizing the schedule. Point to the schedule with a smile or thumbs up when he earns the special privilege, to help him make the connection. As an alternative, you can put pictures of preferred activities at the end of the schedule to let a child with language difficulties know that he can choose something he enjoys once he has completed his tasks. Once he earns his preferred activity, allow him to choose the picture of the activity he wants to do. For children who have trouble making choices, you can pick an activity ahead of time that you know the child enjoys, and put a picture of that activity at the end of the schedule. So if you know your child likes jumping on the trampoline, put a trampoline picture at the end. If he also likes shaving cream, television, playing with blocks, etc., alternate the different activities, so he has an opportunity to earn time for the many things he enjoys. Remember that fun activities can also be built into the schedule itself, such as in the example of the home schedule mentioned previously in this article. Make the expectation you set realistic for the child. For a child with severe behavioral challenges, one day of completing a schedule or even completing one part of a schedule, may be a huge accomplishment and worthy of earning a privilege. For a child with less problematic behaviors, he may be able to go five days with successful schedule completion before earning a really special privilege. See the article 25 Privileges You Can Let Your Child Earn For Good Behavior to have a better understanding of why you should let children earn privileges for following expectations and why this method is not considered a form of bribery. Place the schedule somewhere the child can always see it. 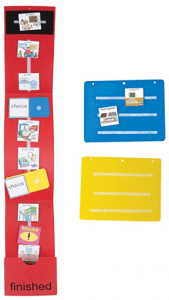 Laminating the schedule can help so it does not get ripped or crumpled (more on lamination below). 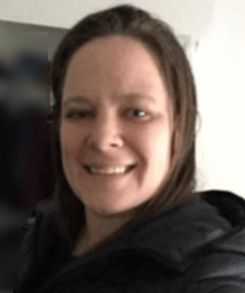 I understand that for parents and teachers with several kids or with many additional responsibilities, a schedule may be hard to keep. Do the best you can, enforcing the rules as best as possible. If it doesn’t work for you or your child/student, that is okay. Not every behavioral strategy on this site will work for every child. These strategies are recommendations based what I have seen work for several children in my career and in research [e.g., Michael B. Ruef (1998) indicated that increasing predictability and scheduling and appreciating positive behavior promotes positive behavioral changes and Banda and Grimmett (2008), documented the positive effects schedules have on social and transition behaviors in individuals with autism.]. Option 4: Use online software to create and print out pictures such as Boardmaker Online. 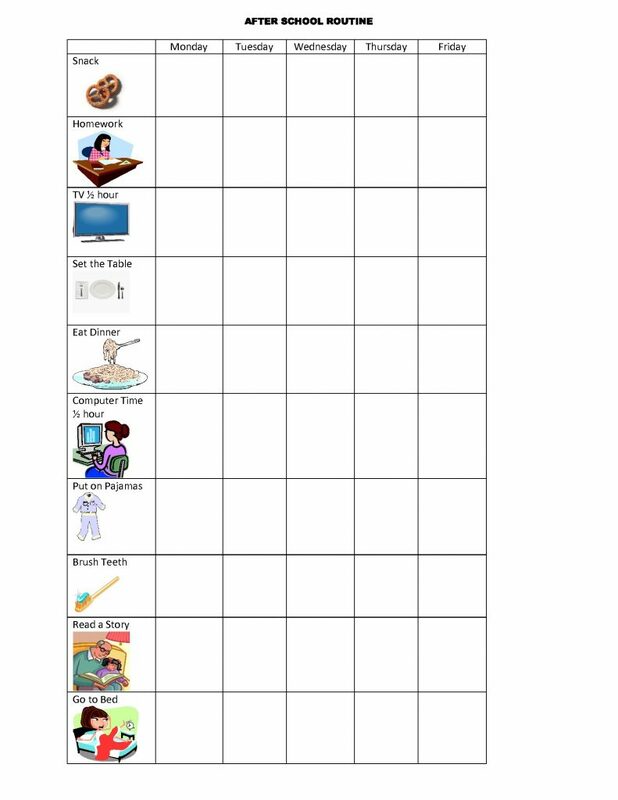 Boardmaker Online has a variety of pictures and templates for creating pictures and schedules. Option 5: Take pictures of your own child involved in the activities that you want pictures for. Develop or print out the pictures and laminate them. The options above discuss making the pictures. Now I will provide some options for creating visual schedules. Laminate the schedule to avoid ripping or crumpling. Click here for the PDF version, which you can print out for your use. Remember, Boardmaker Online has templates as well! If you only want to show a few pictures at a time, using Velcro might be a better option, but if you use a Microsoft Word table like the one above you can cover some of the images with paper or create a few different mini schedules with a few pictures each. As stated previously, this may be beneficial for a child who gets overwhelmed with too many pictures at a time. or make your own schedule strip by cutting and laminating construction paper and using Velcro Strip Tape . Some have complained that the schedule strip in the picture above is easy to make yourself and flimsy, but it is a good option if you don’t want to get crafty. 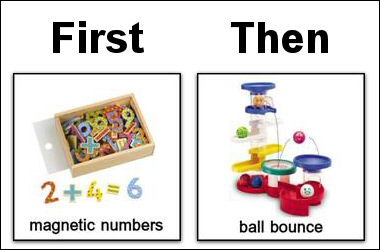 For children who need to alternate between preferred and non-preferred activities or need to know what is happening first and then next, and may be confused by a visual schedule with more than two pictures, you can create a first/then board using the same instructions provided above. Here is a picture of a first/then board for your reference (there are also first/then apps such as the First Then Visual Schedule HD). Keep in mind that children often benefit from removing or crossing off what they have already completed in their schedule. If you have removable pictures or words (Velcroed, taped, etc. ), allow the child to take the piece off the schedule board and put it in an envelope, bin, etc., that is fastened near the schedule. Some pocket charts such as the schedule pocket chart shown above, have a pocket at the bottom to put completed items. 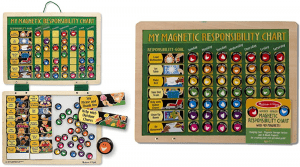 Additionally, you can find some ready-made magnetic schedules online with pictures included. 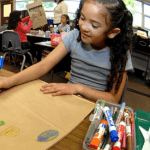 While this article gives strategies for promoting positive behavior using schedules, there are many more ways to create positive behavioral changes. 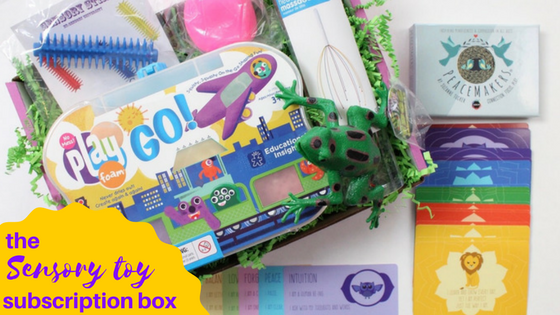 Check out all of our behavior strategies here! 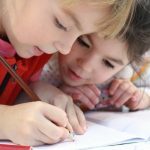 Thank you for visiting educationandbehavior.com, a website that provides free academic, behavior, and social-emotional support for children! Receive our updates on Facebook!